In 2012, for the first time, respondents could indicate more than one language, causing the percentages to exceed 100%. The German-speaking part of Switzerland (German: Deutschschweiz, French: Suisse alémanique, Italian: Svizzera tedesca, Romansh: Svizra tudestga) constitutes about 65% of Switzerland (North Western Switzerland, Eastern Switzerland, Central Switzerland, most of the Swiss Plateau and the greater part of the Swiss Alps). 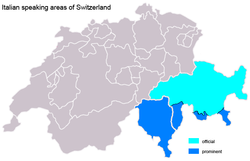 In seventeen of the Swiss cantons, German is the only official language (Aargau, Appenzell Ausserrhoden, Appenzell Innerrhoden, Basel-Stadt, Basel-Landschaft, Glarus, Luzern, Nidwalden, Obwalden, Schaffhausen, Schwyz, Solothurn, St. Gallen, Thurgau, Uri, Zug, and Zürich). While the French-speaking Swiss prefer to call themselves Romands and their part of the country is the Romandy, the German-speaking Swiss used to (and, colloquially, still do) refer to the French-speaking Swiss as "Welsche", and to their area as Welschland, which has the same etymology as the English Welsh (see Walha). In Germany Welsch and Welschland refer to Italy; there, the term is antiquated, rarely used, and somewhat disparaging. The German-speaking Swiss do not feel like a uniform group: the average German-speaking Swiss sees himself belonging foremost to his canton, and does not consider himself as a speaker of Swiss German, but, for example, Baseldytsch (dialect of Basel), Bärndütsch (dialect of Bern) or Züridütsch (dialect of Zurich). This is hardly surprising, however, since there is no single unifying or standard form of Swiss German itself: rather the term "Swiss German" is simply a generic umbrella term referring in general to all of the various different Alemannic German dialects within German-speaking Switzerland. The marked subsidiarity of the Swiss federalism, where many political decisions are taken at municipal or cantonal level, supports this attitude. Nevertheless, in 2017, 11.1%, or about 920,600 of the Swiss residents speak Standard German ("Hochdeutsch") at home, but this statistic is probably mainly due to German (and Austrian) immigrants. By the Middle Ages, a marked difference had developed within the German-speaking part of Switzerland between the rural cantons (Uri, Schwyz, Unterwalden, Glarus, Zug, Appenzell, Schaffhausen) and the city cantons (Lucerne, Berne, Zurich, Solothurn, Fribourg, Basel, St. Gallen), divided by views about trade and commerce. After the Reformation, all cantons were either Catholic or Protestant, and the denominational influences on culture added to the differences. Even today, when all cantons are somewhat denominationally mixed, the different historical denominations can be seen in the mountain villages, where Roman Catholic Central Switzerland abounds with chapels and statues of saints, and the farm houses in the very similar landscape of the Protestant Bernese Oberland show Bible verses carved on the housefronts instead. In addition to this more widespread notion of Swiss German dialect, there is also Walser German, another Highest Alemannic speech brought by Walser emigrants from Valais. The French-speaking part of Switzerland is shown in green on this map. Arpitan language area map with place names in arpitan and historic political divisions. Romandy (French: Romandie, la Suisse romande, German: Romandie, Welschland, Welschschweiz, or in some contexts: Westschweiz,[note 1] Italian: Svizzera romanda) is the French-speaking part of Switzerland. 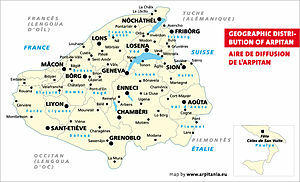 It covers the area of the cantons of Geneva, Vaud, Neuchâtel, and Jura as well as the French-speaking parts of the cantons of Bern (German-speaking majority), Valais (French-speaking majority), and Fribourg (French-speaking majority). 1.9 million people (or 24.4% of the Swiss population) live in Romandy. Standard Swiss French and the French of France are the same language, with some differences. For example, like some other regions of the French-speaking world, Swiss people (as well as most Francophone Belgians) use septante (seventy) instead of soixante-dix (literally, "sixty ten") and nonante (ninety) instead of "quatre-vingt-dix" ("four twenties and ten"). In the cantons of Vaud, Valais and Fribourg, speakers use huitante (eighty) instead of the Standard French "quatre-vingts" (four twenties). "Sou" is used throughout Romandy for a 5-centime coin, as is "tune" (or "thune") when referring to a 5-Swiss-franc piece. Historically, the vernacular language used by inhabitants of most parts of Romandy was Franco-Provençal. Franco-Provençal (also called Arpitan) is a language sometimes considered to be halfway between the langue d'oïl (the historical language of northern France and ancestor of French) and Occitan (the langue d'oc, spoken in southern France). Standard French and Franco-Provençal/Arpitan, linguistically, are distinct and mutual intelligibility is limited. Increasingly, Franco-Provençal/Arpitan is used only by members of the older generations. Italian Switzerland (Italian: Svizzera italiana, Romansh: Svizra taliana, French: Suisse italienne, German: italienische Schweiz) is the Italian-speaking part of Switzerland, which includes the canton of Ticino and the southern part of Graubünden. Italian is also spoken in the Gondo Valley (leading to the Simplon Pass, on the southern part of the watershed) in Valais. The linguistic region covers an area approximately 3,500 km² and has a total population of around 350,000 inhabitants, with the number of Italophones residing in Switzerland being 545,274 (about 7% of the Swiss population). The proportion of Italian-speaking inhabitants had been decreasing since the 1970s, after reaching a high of 12% of the population during the same decade. This was entirely because of the reduced number of immigrants from Italy to Switzerland, but gained again during the last decade. Distribution of Romansh in the canton Graubünden (2000). On the cantonal level, Romansh is an official language only in the trilingual canton of Graubünden, where the municipalities in turn are free to specify their own official languages. Significant communities of Romansh speakers remain in the Surselva, the Sursés/Oberhalbstein, the lower Engadin and the Val Müstair. Besides the national languages and the many varieties of Swiss German, several regional Romance languages are spoken natively in Switzerland: Franco-Provençal and Lombard. About 20,000 Romani speak Sinte, an Indic language. Five sign languages are used: Swiss-German, French, Italian, Austrian, and German. The Federal Palace of Switzerland, with the Latin inscription Curia Confoederationis Helveticae. 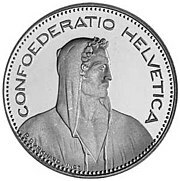 To avoid having to translate the name of Switzerland in the four national languages,[note 2] Latin is used on the coins of the Swiss franc (Helvetia or Confoederatio Helvetica) and on Swiss stamps (Helvetia). The country code top-level domain for Switzerland on the internet is .ch, the abbreviation of the Latin name, Confoederatio Helvetica (Swiss Confederation); similarly, the International vehicle registration code for Swiss automobiles is "CH". The Federal Palace of Switzerland bears the inscription Curia Confoederationis Helveticae. To have a unique name across the country (without favoring German or English), several Swiss foundations and associations have Latin names, such as Pro Helvetia, Pro Infirmis, Pro Juventute, Pro Natura, Pro Patria, Pro Senectute, Pro Specie Rara, etc. ^ "Welsch" is an old German word for "Foreign" and is the same word the Anglo-Saxons used for the original British inhabitants which today are the Welsh people. ^ When there is no room to use the four official languages, unlike on the banknotes of the Swiss franc, on the logo of the Federal administration of Switzerland and on the Swiss passport. ^ "Sprachen 2015" (in German, French, and Italian). Neuchâtel, Switzerland: Federal Statistical Office FSO. 31 January 2017. Retrieved 13 June 2017. ^ "SR 101 The Federal Constitution of the Swiss Confederation of 18 April 1999 (Status as of 12 February 2017): Art. 4 National languages". The portal of the Swiss government (Federal Law collection). Berne, Switzerland: The Federal Council. 12 February 2017. Retrieved 13 June 2017. ^ "SR 441.1 Bundesgesetz über die Landessprachen und die Verständigung zwischen den Sprachgemeinschaften (Sprachengesetz, SpG) vom 5. Oktober 2007 (Stand am 1. Januar 2017): Art. 5 Amtssprachen". The portal of the Swiss government (Federal Law collection) (in German, French, Italian, and Romansh). Berne, Switzerland: The Federal Council. 1 January 2017. Retrieved 13 June 2017. ^ Statistik, Bundesamt für (21 February 2019). "Die zehn häufigsten Hauptsprachen der ständigen Wohnbevölkerung - 2014-2017 | Tabelle". Bundesamt für Statistik (in German). Retrieved 21 February 2019. ^ a b c "Die zehn häufigsten Hauptsprachen der ständigen Wohnbevölkerung" (official website) (in German, French, and Italian). Neuchâtel, Switzerland: Swiss Federal Statistical Office FSO. 28 February 2018. Retrieved 18 November 2018. ^ "SR 101 The Federal Constitution of the Swiss Confederation of 18 April 1999 (Status as of 12 February 2017): Art. 1: The Swiss Confederation". The portal of the Swiss government (Federal Law collection). Berne, Switzerland: The Federal Council. 12 February 2017. Retrieved 13 June 2017. ^ "Difficulties & Differences through Switzerland's Language Diversity". www.internations.org. Retrieved 21 October 2018. ^ Statistik, Bundesamt für (29 January 2019). "Ständige Wohnbevölkerung ab 15 Jahren nach zuhause gesprochenen Sprachen - 2017 | Tabelle". Bundesamt für Statistik (in German). Retrieved 21 February 2019. ^ "Bilan de la population résidante permanente (total) selon les districts et les communes". Neuchâtel, Switzerland: Swiss Federal Statistical Office. 2 January 2015. Archived from the original (XLS) on 6 August 2011. Retrieved 24 October 2015. ^ Dominique Didier. "Septante, octante ou huitante, nonante". Monsu.desiderio.free.fr. Retrieved 22 October 2015. ^ "Bevölkerung, Strukturerhebung der eidgenössischen Volkszählung 2011: Bevölkerung nach Sprache und Religion, Ständige Wohnbevölkerung ab 15 Jahren nach zuhause gesprochenen Sprachen, 2011" (Statistics) (in German, French, and Italian). Neuchâtel, Switzerland: Swiss Federal Statistical Office. 30 May 2013. Archived from the original (XLS) on 14 November 2013. Retrieved 22 December 2013. ^ a b Wittmann, Henri (1991). "Classification linguistique des langues signées non vocalement" (PDF). Revue québécoise de linguistique théorique et appliquée 10:1.215–88. Retrieved 22 October 2015. ^ "Population résidante permanente de 15 ans et plus, selon les langues principales1), en 2015". bfs. Retrieved 9 July 2018. Wikimedia Commons has media related to Languages of Switzerland.